Welcome to View From The Opposition. This is our website feature that we will be putting out every week ahead of our upcoming matches this season. This weekend sees Gloucester City travelling to The Aspect Arena to take on the Beachboys for our opening Vanarama National League South game of the season and we’ve got one fan interview for you all to read. 135 years old. Homeless for the last 11 years. Played in the National League North for 8 years. The club spent 7 years groundsharing with Football League side Cheltenham Town before spending 2 seasons at Cirencester Town and they’ve spent 1 season at Forest Green Rovers. They are now into their 2nd season groundsharing with Evesham United. They’ve spent 1 season so far in the National League South and and the club could be finally return home by 2020. This is the oppositions view of our first league opponents of the season Gloucester City. Our opponents were first formed on 5th March 1883. It was also the same year that Robert Louis Stevenson’s Treasure Island novel was published whilst Blackburn Olympic beat Old Etonians 2-1 in the FA Cup Final at The Oval. That game was proved to be the last to feature an amateur side in the final and the first to feature a working class side. The first Prime Minster following World War 2 Clement Attlee was also born in the year whilst Queen Victoria was still on the British throne. The club has had 3 names during their 135 year history with the original name being Gloucester until 1902 where they decided to change it to Gloucester City. From 1910 to 1925, the club were known as Gloucester YMCA before changing back to their second name. For a record 70 years, the club played their trade in the Southern League from 1939 to 2009 where they eventually won promotion to Step 2 following a play-off final win over Farnborough however 2 years before that, the clubs Meadow Park stadium was severely ruined by the 2007 floods that left the ground 8 feet under water. Since that unfortunate time, the club has effectively been homeless or as the Tigers put it, exiled from Gloucester. There have been attempts to bring the club back home but most of the early plans were rejected by the council. This included groundsharing with Gloucester Rugby Club in a ground that was set to have 15,000 capacity (25,000 extended) but the rugby club rejected the ideas as deeming them as too expensive. However since 2015, the club has made new plans to return to Meadow Park but with the ground height increased up by a few feet to avoid flooding of a similar type occurring from 2007. The plans have been accepted by the council and the new Meadow Park stadium is currently in construction as we speak. Its rather safe to say that the Tigers deserve to be back home soon after 11 years away. 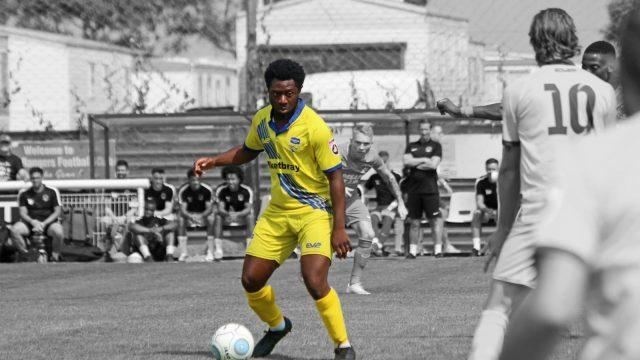 Similar cases of being away from their true homes include AFC Wimbledon who are hoping to move back to South London from Kingsmeadow in Kingston, Surrey and most recently Truro City who are now set to ground-share with Torquay United for the upcoming season at least. 1 – What has it been like supporting Gloucester over the last few years? Life as a fan of Gloucester City has never been easy and we are now starting our twelfth season in exile. This will be our second season at Evesham United and last season was definitely the toughest since being forced out of Meadow Park in 2007 both on and off the field. Facing a 50 mile round trip for home games has hit our attendances and the set up at Evesham makes it difficult to create any atmosphere. However, we have a fantastically loyal band of fans who will follow the club all over the country. We also have plenty of fans who like the club are in exile and attend ‘away’ games when they can. To add to this, the Supporters Trust recently announced that we have raised over £900,000 since its formation in 2001 which is yet another testament to prove what a great set of fans we have. Major personal changes off the field were a distraction to the poor results on the pitch which saw us in the drop zone and in a relegation battle last season. Marc Richards stepped up to manager and a turnaround in form at the turn of the year saw us pull away to safety. Activity around our return to Gloucester has stepped up a gear in recent weeks so there does appear to be some light at the end of the tunnel. 2- How Do Think Pre-Season Went For The Club? I always find it difficult to gauge pre-season and the impact that it will have on the season ahead. We’ve got a record of P7, W3, D3, L1. The defeat was against a Derby County U23 side. Our last game was our County Cup Final held over from last season. We drew 1-1 with Bristol City U23’s, losing the resultant penalty shoot out 7-6. 3 – What Are Your Hopes For The Season Ahead? As the rank outsiders with the bookies, our first objective is to ensure we finish outside the bottom 3 so that we are still at National League South level when we return to Gloucester. Last season we surprised some of better teams in the league, picking up some great results on our travels. Personally I think we will do the same again this season and hopefully make a great start by picking up 3 points on Saturday. 4 – Who are the key players that we should be looking out for this Saturday? All our players are key so you’ll have to watch all of them We’ve got a good bunch of talented individuals who are all fighting for the club. 5 – What Is Your Predicting Starting 11 For The Game? Predictions are never my strong point but I’m going to go with this as a line up: Matt Yates, Isaac Kelly, Adam Page, Spencer Hamilton, Sam Avery, Jack Deaman, Joe Hanks, Chris Knowles , Jake Mawford, Jake Jackson, Ben Seymour. We would like to thank Ian for being the contributor to this feature that we will be posting ahead of every Concord game this season. We would also like to wish him and all of the Gloucester City fans all the best this season. His Twitter account is @GCAFCSupporters so please feel free to give him both a follow.